instead of a content marketing strategy, you could well be missing out on a lot. Like a consistent flow of leads or developing your entire market rather than just one campaign. Where’s the market in your marketing? You may have heard of the monocle. It’s a very old fashioned form of eye wear, only really seen now on costume dramas set in the eighteenth century. Funny how out of date things get...like old fashioned ways of targeting your ideal prospects, like sticking to the same old marketing channels instead of exploring new and more effective content marketing options “because that’s how we’ve always done it”. Isn’t it time to drop the monocle? Felt like you’ve gone two rounds in the ring after you’ve gained a new prospect? That’s even before you’ve started converting them into a customer. If searching for sales leads is a four letter word, it’s probably time to look at content marketing approaches that actually bring the prospects to you. 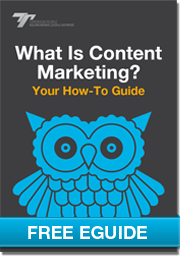 Read more in 'What Is Content Marketing? Your How-To Guide'. Click here to download it now!